End of Masonic Year Festive Board A Success! 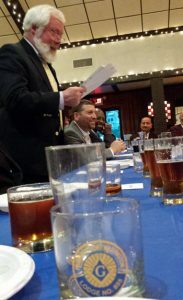 On the evening of Tuesday May 24 the Brethren and guests of Paumanok-Port Washington Lodge No.855 celebrated the end of the Masonic year with the traditional Festive Board. R:.W:.Warren Obes as Master of Ceremonies was impeccable in his delivery of the traditional dissertation of a Masonic feast that took place in the 14th. century. 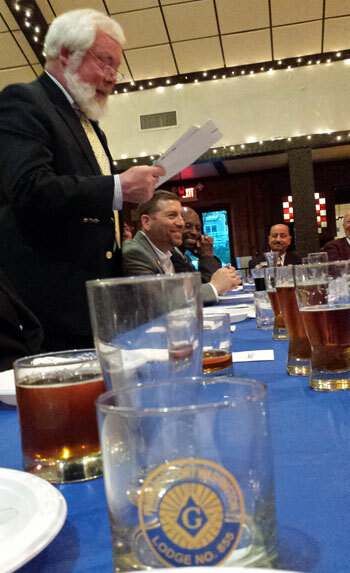 Both guests, newly raised Master Masons and veterans of this event were not only satisfied with a seven-course meal but filled with brotherly love in their hearts. This would not have been possible without the hard work of Bro. Greg Brenner who showed up extra-early and together with newly raised Brothers Kadir Olav and Brandon Sax, whom acted as Stewards, setup the banquet hall in the blink of an eye. Thank you W:. Adam Bernstein – outgoing Master – for a great end to your year. Pictured left to right – R:.W:. Warren Obes, W:. Adam Bernstein, W:. Brian Saley, W:. Rattan Hemrajani.